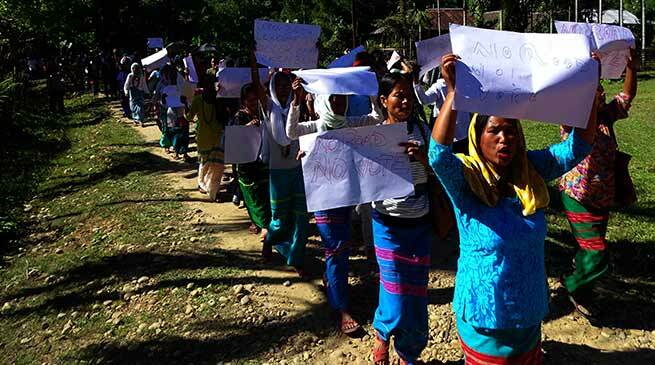 “No Road No Vote” – it was decided by the people of Kangku Circle Demanding road connectivity in Kangku Circle. The local people has decided to boycott the upcoming bye election of the 28th Likabali Assembly constituency, which is schedule on 21st December next. In Kangku Circle has 9 polling station and the voters of all polling stations decided to boycott up coming election. Addressing media person here today at Arunachal press club No Road No Vote’ Mission Central executive Committee Coordinator Mikjo Tajo inform that the 26 villages of the Kangku Circle are still not connected by road till toady. Whereas, the circle is hardly 15 km away from National highway of Assam and around 65 km away from Likabali. He also said that ” they planning this mission for 2019 vidhan Saba election, but bye-election is right time to raise their voice on the government, who is keeping this circle from last 38 years without road connectivity”. Though till now two Chief Ministers, MoS Kiren Rijiju and many other ministers visited this Kangku Circle but the situation remain same. At last people of this circle has decided to fight with Central and state government with democratic way for road connectivity. Claiming both the Central and state government is neglecting this Circle, Galo People Federation (GPF) President Nyadaar Loya inform that the villager of the Circle has Started this mission of “No road no vote” few month back. A people referendum rally was also organised on 18 November at the Circle Headquarter ‘Kangku’ followed by a signature campaign on the same issue. Resident of all 24 villages of this circle were participated in that rally and signature campaign and extended their supports of “No vote No Road Mission”. Further he also inform that in this regards federation has submitted a memorandum to the Chief Minister of state and also copy to the Chief election Officer of state on 20th Novembers last. And after notification of bye election , the federation also submitted a letter to Prime Minister of India, Chief Election Commissioner (ECI) of India and MoS Kiren Rijiju and inform them that peoples of the Circle is boycotting the upcoming bye election in support of their demand .